There is a nice bit in some old cycling book, written by Greg Lemond. 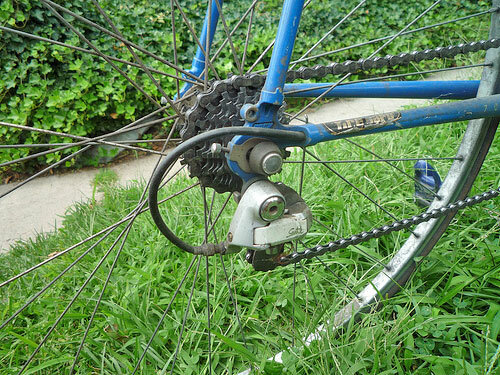 He advises cyclists not to bother with Shimano’s new 7 speed – it won’t catch on. He says 6 speed will be fine. It’s appears wonderfully outdated now. If only we had to worry about 7 speed! Cycling is an annoyingly expensive hobby. I’m just ordering a new bike, and of course I want to get the best. That means Dura Ace Di2, which will have to be 11 speed. I would have been quite happy with 10 speed. I really doubt having 11 cogs rather than 10 will make any difference in time trials – even in hilly time trials where you use a full range of gears. An old fashioned 7 speed cassette. Look how closely the ratio is. Not so good for getting up Hardknot pass. At the moment, I have a large collection of racing wheels. They all have 10 speed cassettes on. It is very convenient because I can easily switch wheels between road bike, training bike (actually 9 speed, but it works in emergency) and time trial bike. But, this move to 11 speed only increases the inconvenience and pressure to upgrade all the other bikes to 11 speed. This is the problem with cycling, there is a great pressure to keep spending money. True, I could have stuck with a mechanical 10 speed. But, when you win and lose races by 2 seconds, there is always the pressure to look for marginal gains. I admit that it was worth making the upgrade from 6 speed to 7 speed. 7 speed gives you more choice, which is useful on hilly routes. But, I really hope Shimano and Campagnolo don’t bring out 12 speed gears. There is no need for it. If they do bring it out, it won’t be so much for the performance benefits, it will be just to get cyclists to spend more cash in that 3-4 year cycle of upgrading. Cycling is supposed to be cheap and simple, but something somewhere went wrong. Now, does anybody want to buy some second hand 10 speed cassettes? My road bike and TT bike are both 9 speed. My disc wheel is 8 speed – I use friction shift on the TT machine. My training wheels for it are 7 speed. I’m thinking of upgrading the lot to 6 speed. Yep! I just “upgraded” to friction shifters too. Only on my rollers bike for now, but considering it for my climbing bike also. i have many 10 speed wheels and cassettes, and I am not going to buy 11 speed, as 12 speed will certainly arrive, and I will wait for that, when it does 11 speed will instantly be dated, but 12 speed will remain for a long time, as folk have a fear of 13 speed and 14 if possible, might be 15 or 20 years off. Shimano have a patent on a single sided chain for 14 speed, it sounds a bit freaky. There is a copy of the patent on line, with a google search.